Dr. Robert Zubrin (PhD in nuclear engineering from the University of Washington) has spent his life exploring issues related to survival of life in hostile environments. Working with NASA and the private organization he founded (the Mars Society), Dr. Zubrin has looked deeply into what is needed for humans to live and flourish. His findings bring him in conflict with a number of current movements and trends that appear to have as their goal the achieving of a significant reduction in the human population on earth. In contrast to the historical views of humans as having dignity (a belief supported both by the Judeo- Christian tradition and the later Renaissance humanists), these latter-day “antihumanists” (Dr. Zubrin’s term) promote a different and very dangerous viewpoint. He begins to build his case with a lengthy and telling exploration of two somewhat related ideas: the theory of evolution and the eugenics movement. Instead of focusing on the scientific questions, Dr. Zubrin provides data to show the racist nature of early evolutionary thinkers including Darwin. The complete title of Darwin’s greatest work is almost never quoted: The Origin of the Species by Means of Natural Selection or the Preservation of Favored Races in the Struggle for Life. This book strongly influenced such people as Francis Galton, a cousin of Darwin. Galton built on Darwin’s work to develop the “science” of eugenics—the belief that all characteristics were inherited. He taught that “superior” families should be encouraged to have more children while “inferior” groups should be restricted from having any at all. Another later follower of Darwin’s ideas was Ernst Haeckel, a prominent German biologist of the 19th century. Among other contributions, Haeckel developed the idea of “ecology,” which later began to put forth ideas that Dr. Zubrin feels gave rise to the modern antihumanist movement he strongly criticizes. Haeckel believed that there were at least 12 different human species, with the white race at the top of the heap and Africans at the bottom, closest to the apes. This elitist thinking strongly influenced German military and government leaders in the early 1900s and was later adopted by Adolf Hitler. Dr. Zubrin’s analysis of the contribution of Darwinian thinking to the events of the Holocaust is thorough, well-documented, and supported by other scholars such Richard Weikart, a Cal State history professor, who wrote a book entitled From Darwin to Hitler. The eugenics movement also flourished and its ideas were adopted by Margaret Sanger, the founder of Planned Parenthood. Other national government leaders also jumped on the eugenics bandwagon and the goals of population control and forced sterilization soon became U.S. policy. From there the story becomes complicated and involved, but Dr. Zubrin ably depicts all the key players and events. Related to the population control ideas were movements involving public health and environmental issues. Dr. Zubrin explores the complex stories of restriction of vaccinations for specific populations; banning of pesticides (even though they helped lower the death rate form malaria significantly in Third World countries); and the current controversy over global warming, with its drive to restrict employment and production. The book is thoroughly documented, both a help and a hindrance. The book must be read in its entirety to discern motives. Dr. Zubrin attributes attitudes and motivations to individuals that may or may not be valid. The actual statements are needed to begin to discern the true feelings of a person toward a particular event or issue. 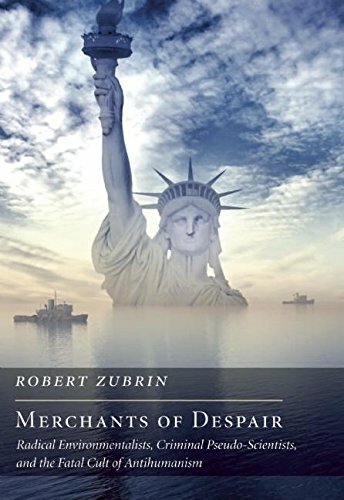 Merchants of Despair: Radical Environmentalists, Criminal Pseudo-Scientists, and the Fatal Cult of Antihumanism is a compelling book that challenges some current ideas and programs of importance. Robert Zubrin raises some excellent questions that need honest answers.